Shaker Style furniture had its humble beginnings in the pious Shaker religious community in the northeastern region of the United States. Since then, Shaker style furniture has grown in popularity. And, today, its iconic design features have become part of the world of wood furniture. Since the 19th Century, countless furniture styles have come and gone. But Shaker furniture remains virtually unchanged. In fact, it’s more popular today than ever before. So what accounts for Shaker’s timeless appeal? The answer is simple: the Shaker style charms furniture lovers with its graceful blend of function, style and durability. The Shaker design is functional. You won’t find exaggerated curves, superfluous panels or intricately-carved accents. Rather, Shaker furniture focuses on a stately design that emphasizes practicality and comfort. The Shaker design is stylish. Subtle curves and straight angles converge in a design that’s both solid and graceful. In fact, the Shaker look is graceful enough to blend in with any high-end home decor. Yet, it’s humble enough to meld with mix-and-match furnishings. So the Shaker style is versatile. Truth be told, the Shaker and Mission styles have become the iconic face of American furniture today. Also, the Shaker design is durable. 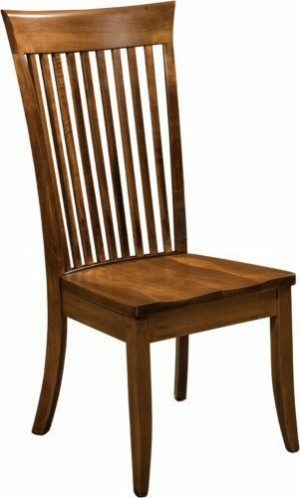 The original Shaker craftsmen built solid wood chairs. And these basic, well crafted chairs provided comfortable, durable seating for their large religious gatherings. Also, this sturdy construction results in pieces that are destined to become treasured heirlooms. And today, Amish artisans keep alive the dedication to quality construction that the original Shaker craftsmen embraced. Paradoxically enough, today’s Amish craftsmen use traditional woodworking techniques handed down from their Anabaptist ancestors in Switzerland and Germany. Are you a long-time furniture-enthusiast or a novice in the world of wood furniture? Either way, you can instantly recognize the beauty of Shaker style furniture. To learn more, visit Brandenberry Amish Furniture in Shipshewana, Indiana. And see for yourself the vast collection of Shaker style furniture.